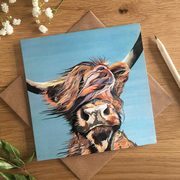 Everyone love a Highland Cow, but there's not always space! That's why this stunning art magnet of Black Highland Tina is a great addition to the home. The perfect size to slip into a birthday card for a Scottish friend!